Can Schools Solve the Tech Industries Diversity Problem? | Horizon Technology Partners, Inc.
Can Schools Solve the Tech Industries Diversity Problem? 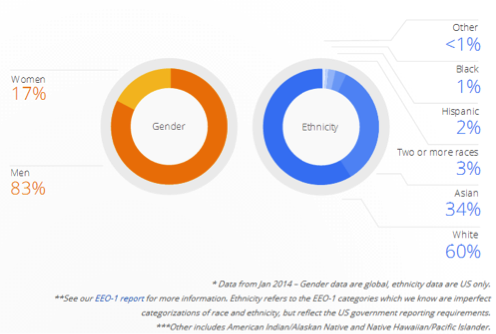 A few months ago, Google and Yahoo released the diversity numbers in their workforces. Since the release of the information, there have been many wondering why these tech companies’ diversity numbers don’t reflect the American population’s diversity. As you can see from these statistics, both Yahoo and Googles workforce is predominantly white and male. At Yahoo women make up a measly 15% of the tech workforce and at google they make up 17%. Racially Yahoo’s US based tech staff is 35% white, 57% Asian, 3% Hispanic, and 1% black. Google’s diversity is no better at 60% white, 34% Asian, 2% Hispanic, and 1% black. The Bureau of Labor Statistics numbers show 47 percent of the total workforce in the United States is made up of women, 80 percent of U.S. employees are white, 12 percent are black and 5 percent are Asian. So, why is it that Google, Yahoo, and other tech companies struggle to reflect the demographics of the country? Companies like Google and Yahoo agree that there is a diversity problem, but argue that it is due to a lack of applicants. 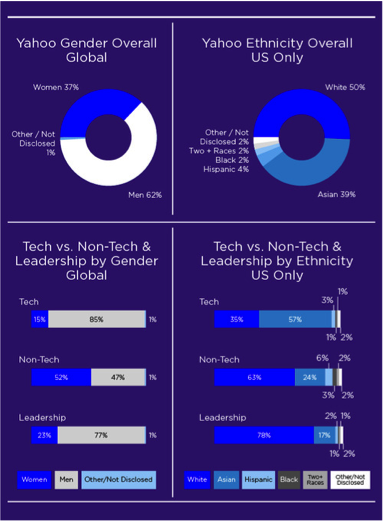 The majority of applicants in the tech industry are white and male. But when we look at the people that are getting degrees in computer science, we can see where the issue really lies. Women make up only, roughly, 18% of Computer Science grads in the United States. Blacks and Hispanics each make up under 10% of US college grads. With these numbers, it’s no surprise there is a lack of diversity in computer science careers. In our society the stem careers are more often than not, considered to be ‘male jobs’. Jobs that require a lot of mathematical thinking and little artistic talent. Which is entirely incorrect. Many people concerned about this diversity problem believe that by introducing STEM careers at a younger age, children will be more likely to grow up without the known preconceptions one thinks about when they think of stem careers. Research from Mother Jones shows that girls tend to pull away from STEM subjects, including computer science, around middle school whereas the rates of boys in these classes remains steady. Researchers noticed that students of different ethnicities generally had to travel longer distances to get to school, and as such they couldn’t stick around for extracurricular activities. The best way to change the gender bias, is to change the representation of STEM careers. Men and women have differing priorities. A 2009 study by acm.org tested different messages about computer science to high school students. The graph below illustrates what career characteristics the students found important. having the power to do good and doing work that makes a difference in other people’s lives. In our culture the dominant cultural opinion on computer science is that by choosing that career path you will be in a high paying position and be involved with the newest cutting edge technological innovations. Incentives that speak to a predominately male culture. But a career in computer sciences can do so much more than just offer you a high paying job. “We build open source technology and organize a network of people dedicated to making government services simple, effective, and easy to use. We encourage and empower residents to take an active role in their community. We facilitate collaboration between government staff and foster forward-thinking approaches to solving city problems. Knowledge of programs like Code for America could be what sparks and interest in computer science for young girls who are more concerned with helping others than working in a cutting edge field. It’s possible that by ‘selling’ the idea of the computer sciences in a different manner to children at an earlier age, they will be more likely to continue taking computer science classes throughout high school and potentially into college. So, can schools save the tech industries diversity problem? From these studies, it seems that there is a high chance of female students becoming more involved in the computer sciences in the near future. Unfortunately the strategies being implemented don’t focus on the ethnic diversity problem.